An internationally-renowned golf course’s commitment to its community and natural environment has earned it a coveted global sustainability accolade. Royal Dornoch Golf Club has been awarded the GEO Certified® ecolabel, an international symbol of ‘great golf environments’. This recognises clubs that have met high standards for performance in nature conservation, water and energy efficiency, ethical and environmental supply chain, pollution control and community engagement. The award not only further elevates the standing of the historic club, but also enhances its ability to host major events. The R&A, the game’s governing body, is a supporter of GEO (Golf Environment Organization) and the Certified ecolabel is now a prerequisite for clubs staging large competitions. All ten host venues for The Open are now GEO Certified®. Richard Allison, Project Manager, GEO Certified – Facilities, said: “Royal Dornoch is an outstanding example of a golf club with sustainability as a natural extension of its operation. The assessment highlights the “exemplary” management of a Site of Special Scientific Interest which adjoins the golf course and states the club’s energy resource management is “particularly impressive”. A new maintenance facility runs on renewable electricity with solar-PV cells providing 12 kilowatts of energy for daily use with surplus returned to the National Grid. An air-source heat pump provides hot water and underfloor heating for the offices and communal areas, while in the clubhouse major energy initiatives include a phased changeover to LED lighting, installation of smart meters to track consumption accurately, and motion sensors and push-button timers throughout appropriate areas. Electric vehicles are also being introduced to the club’s maintenance fleet. The club regularly monitors wildlife on the course, with species including otter, snipe, woodcock and pine marten all resident. Royal Dornoch’s support for the community includes making donations to a number of organisations through a variety of funds. The GEO assessment highlights money raised to provide defibrillators in the town and a community fund that has distributed about £20,000 to worthy causes in three years. 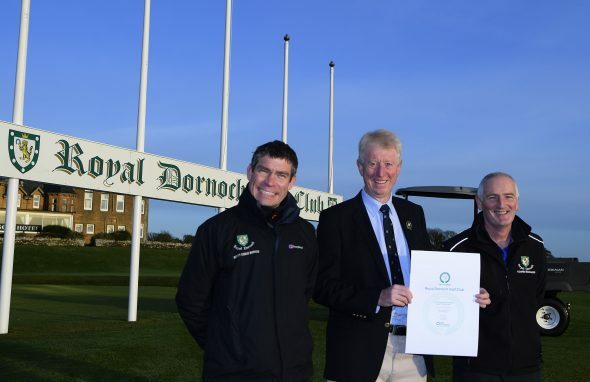 Royal Dornoch’s general manager Neil Hampton said: “This is a very important award for us. We take enormous pride in our environment and are committed to doing everything we can to act responsibly and sustainably. “The club also takes seriously its role in the community and be as good a neighbour as we can be.